✔ 3-LAYERS DURABLE PADS: MOCOFO chair glides combine a thick layer of felt and two layers natural,thick rubber foam pads which provides cushioned support and a non-slip surface. The thicker the rug pad, the better the comfort, protection, insulation and soundproofing for your rooms. Mocofo 1/4" thickness pads let your floors to stay beautiful for a long, long time. 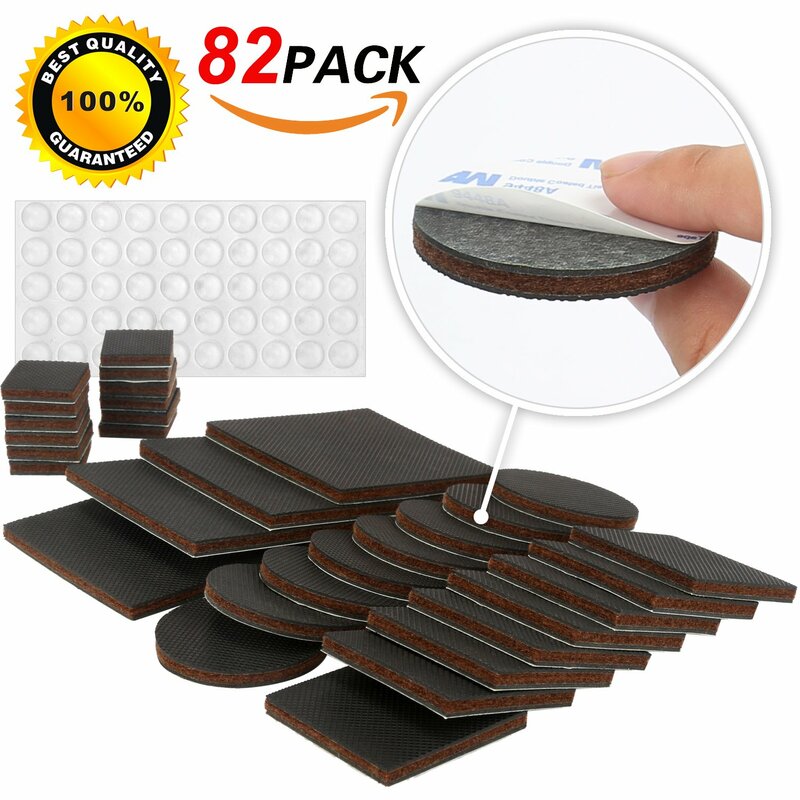 ✔ EXTRA-STRENGTH SELF-STICK ADHESIVE:Unlike other similar pads,Mocofo Heavy Duty rubber feet has a great top layer of adhesive that carefully holds them on the furniture leg. This allows our rubber glides not to come off from your sofa or couch feet when you move it! ✔ PREMIUM SOLID FELT:We use the most dense fiber to fill the center of Mocofo pads.This felts made of Recycled fibers,provideing a reliable point of support to your furniture and strong protection from the pressure of your furniture on the floor. ✔ VARIETY 32 PADS:Your pack comes with 1" Square Pads 12 Pack,2" Square/Round Pads 16 Pack,3" Square Pads 4 Pack with 20 Pces additional adhesive sticker and 50 clear bumpers 1/2".Do without Cut, Easy and Fast! ✔ ORDER IT NOW RISK FREE:We Guarantee our customers 100% satisfaction with our premium floor sliders!If you don't like our rubber feet or some of them don't perform for the stated time, just email us, get a New Replacement or a Full Refund WITHNO Excuse! A patented rubber layer on each side,providing a cushioned protection. 1/4"Thick rubber which will not discolor or stain your floors and avoids damage to the floor. Natural Rubber within a low VOC material, which grips the floor without sticking. Watch out for fake rubberized pads, which can cause serious damage to your floors. Most dense fiber to fill the center of our pads – so dense that no amount of furniture pressure can penetrate to reach the floor. The fiber consists of recycled material . Prevents scratch to the floor and prevent movement of the pad. The difficulty with any type of furniture pad is in keeping it securely fastened to the legs of the furniture.Heavy-duty Mocofo gripper pads with extra-strength, self-stick adhesive let you don't worry about wearing out or falling off with use. Additional 3M Double Coated Adhesive Stickers to make replacements easily. Computers, Lab Equipment, Home Entertainment Systems, Tripods, Speakers, shop equipment within weight range given, All Major Washer and Dryer Appliances, HVAC units etc. In the event that any of our rug pads do not perform for the stated time, you may email us for an immediate replacement, including any shipping costs or a full refund. Please contact us directly with any performance related issues. (50) Round Clear Bumpers 1/2"